Photo: Halona Blowhole, O`ahu. 70 ft.
Author/photographer John P. Hoover lives in Honolulu. 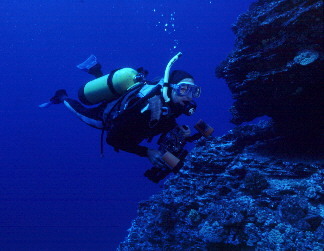 He has published two books on marine life of the Hawaiian Islands. His third, a field guide to the marine invertebrates of the Hawaii, will be available approximately February 1999. With over 600 photographs, it will cover 500 species, including 66 of Hawaii's most colorful and interesting opisthobranchs. 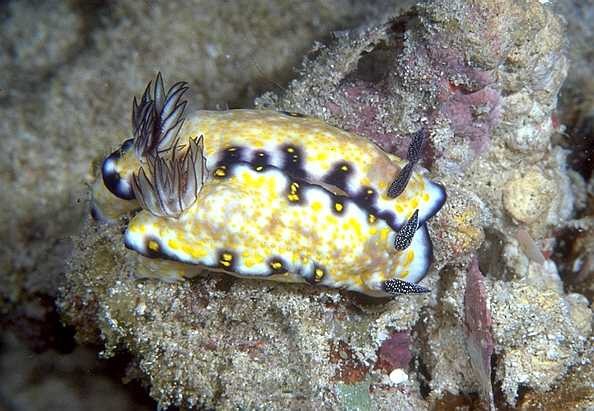 Hawaii's Sea Creatures, a guide to Hawaii's Marine Invertebrates. Mutual Publishing, 1999. John's books are available through Sea Challengers ! "...As for camera equipment: I have a Nikon N90s in an Ikelite housing. I use an inexpensive Sigma 90 macro 1:2 that requires a closeup lens to bring it down to 1:1. This is a very compact lens, enabling me (forcing me) to I get very close to the subject, which maybe improves the image somewhat. I have two small Ikelite M50 strobes on either side of the camera. They are mounted on Ikelite's cheapest "arms"--basically handles that attach to the tray of the housing. These are not fancy arms, although I can adjust them somewhat. Basically they just point straight ahead. And they put the strobes very close to the subject. Also, they allow me to get the camera into small spaces that conventional arms would not fit in. But I didn't plan any of this! It just turned out that way because I bought cheap equipment. I discovered that if I put the Sigma closeup lens on an ordinary Nikon 35-80 zoom, at 35mm I could do what I call "wide-angle macro"--i.e. I can photograph larger subjects and still remain very close to the subject. The Pleurobranchus was done that way. The water at Magic Island is pretty dirty. If I'd had to back away to get the whole slug in the frame the backscatter would have ruined the photo. "Wide-angle macro" saved the day. I set my N90 on manual and use TTL strobes. F-Stop is usually F16 or F22 for macro and shutter speed 1/250. Film: I use almost exclusively Ektachrome Elite 100. Velvia's great, but the extra speed of the Ektachrome permits a bit more depth of field for fish or larger invertebrate shots, which I do a lot of..."
John of course takes lots of pics like the rest of us, its certainly not a slam dunk! It goes back to some advice I received a long time ago from a famous underwater photographer in the Philippines--You can have the most expensive camera equipment in the world, but if you don't know how to use your camera gear, its all for naught! Know your camera equipment to realize its greatest potential! This bit of advice applies equally to housed and framer based Nikonus systems! For most of us this means getting wet and taking lots of pics which I find quite enjoyable!